Fantastic article in the WSJ today about the pending bailout plan to GM, Ford and Chrysler. America has two auto industries. The one represented by GM, Ford and Chrysler is Midwestern, unionized, burdened with massive obligations to retirees, and shackled to marketing and product strategies that have roots reaching back to the early 1900s. The other American auto industry is largely Southern and non-union, owes relatively little to the few retirees it has, and enjoys a variety of advantages because its Japanese, European and Korean owners launched operations in this country relatively recently. Their factories are newer, their brand images and marketing strategies are more coherent -- Toyota uses three brands in the U.S. to GM's eight -- and they have cars designed for the competitive global market that exists today. Depression era flashback: Walking to work on Friday (42nd St and Vanderbilt), I bumped into Paul Nawrocki. He is looking for a job in Operations without much success. He got the idea for the sandwich board from an ex-Lehman employee who found success with it. Ok, we have the Presidential election behind us, and ugly NFP yesterday (more to come) even more Bailouts soon (more AIG, more GM, who knows what else). What is on your minds? What are you thinking about? Once again, I am en flagrante delicto just as this report hits. Please report the details in comments . . . . Tomorrow is NFP day, and I am expecting a doozy of a number: a loss of 250-300k jobs, and the Unemployment rate ticking up towards 6.5%. But even that number does not accurately portray the amount of employment damage that has been done the past few years. Indeed, one of the ways we correctly anticipated the economic falloff was by analyzing the weak employment data beneath the headlines over the past few years. Does that relatively mild U3 unemployment rate accurately portray the employment circumstances? U3 is the official UE rate, but the BLS also reports a full -- and much uglier measure -- U6. I've long said that the U6 number is more accurate, and more and more people are recognizing that as the case. "It's hard to overstate the poor numbers coming out of Wall Street in recent months. But could it be that we're overstating the gravity of the situation? As job losses have mounted and consumer confidence has plunged, policymakers, news organizations, econo-pundits, and even some of my Slate colleagues have noted that the unemployment rate, which rose to 6.1 percent in September, seems to be at a nonrecessionary, noncatastrophic, low level. The unemployment rate is still below where it was in 2003; and between September 1982 and May 1983, the last very deep recession, it topped 10 percent. But maybe the employment data are much worse than they seem. In the past year, the two key measures of employment—the unemployment rate and the payroll jobs figure—have been poor but not awful. The unemployment rate has risen from 4.5 percent a year ago to 6.1 percent. 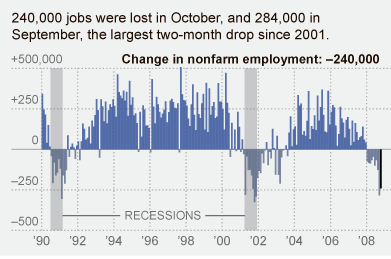 And in the first nine months, 760,000 payroll jobs were lost. This is unwelcome but not catastrophic. So why do things feel so bad? It's not because, as Phil Gramm suggested, we're a nation of whiners. And it's not a matter of columnists and spin doctors shading the numbers to make things look worse. Rather, these two figures are undermeasuring the weakness in the labor market. By some measures, in fact, the job situation is worse than it has been at any time since 1994. "BLS has been compiling alternative measures of labor underutilization. There are many different varieties of labor underutilization. There are marginally attached workers: "persons who currently are neither working nor looking for work but indicate that they want and are available for a job and have looked for work sometime in the recent past." There are discouraged workers, a subset of the marginally attached crowd, who have "given a job-market related reason for not looking currently for a job." 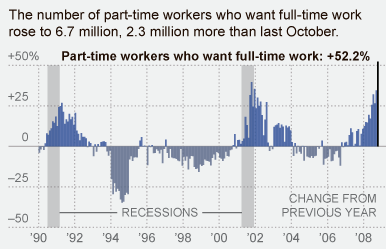 There are people who work part-time because they can't find—or their employer can't provide—full-time work. There are people who have left the work force entirely. Neither the unemployment rate nor the payroll jobs figure captures the plight of many of these folks. The alt.jobless rate was waring of trouble long before the U3 headline data did. U6, the broadest measure of unemployment, rose to 11% in September. That's the highest level since the data series started in 1994. 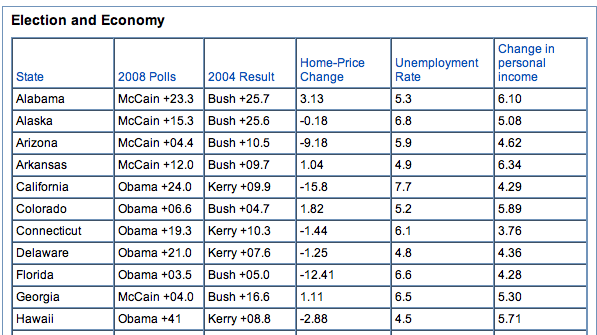 Dan points out that Its also "significantly higher than it was in the last recession, in 2001. . . The unemployment rate may still be historically low, but the underutilization is historically high." What does this mean for tomorrow's number? Only that the economy has been far worse, for far longer, than most investors may realize. The unemployment rate seems low. That's because it's not counting all those underemployed workers.